Conservationists have warned that the entire species of the critically endangered Javan rhino could be wiped out if a tsunami were to strike again. They once roamed the jungles of South East Asia and India, but today only 67 exist in the Ujung Kulon National Park, which was hit by last week's tsunami. The park sits in the shadow of Anak Krakatau, the volcano which triggered waves that killed hundreds of people. The volcano remains active and officials are now rushing to move them. Two park officials were among the 430 killed by the tsunami, and numerous park uildings and ships were also destroyed when the tsunami hit last Saturday. But the Javan rhinos left in the park - the only ones left in the world - were left unscathed. The rhinos typically live along the park's south coast and this tsunami hit the north coast - many are keenly aware that the rhinos might not be so lucky if there is another disaster. The Javan rhinos are the most threatened of the five rhino species in the world - and have been listed as Critically Endangered on the IUCN Red List. They were once found in northeast India and across South East Asia but their population was quickly depleted as a result of poaching, habitat destruction through agriculture, among other factors. According to the WWF, Vietnam's last Javan rhino was poached in 2010. "As there are no Javan rhinos in captivity anywhere in the world, should we lose this population, we've essentially lost the entire species," said Nicola Loweth, a WWF officer in a statement about the rhinos in Indonesia. Anak Krakatau began showing increased signs of volcanic activity since June earlier this year. But it was last Saturday that volcanic activity from Anak Krakatau is believed to have set off undersea landslides, triggering a tsunami that has killed at least 430 people so far. Authorities say Anak Krakatau is still active, and is in fact becoming increasingly active with what are known as Strombolian eruptions - short lived, explosive blasts of lava - being emitted. 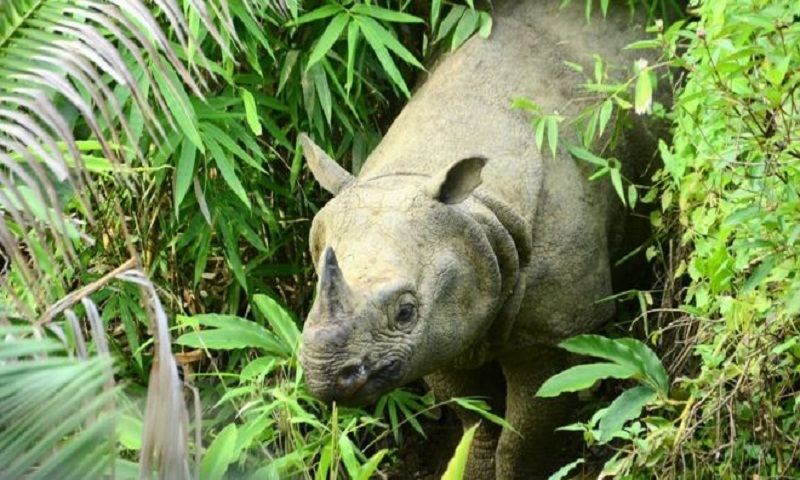 "We understand that we cannot let the Javan rhinos live only in Ujung Julon," Widodo Sukohadi Ramono, chairman of the Rhino Foundation of Indonesian (YABI) told BBC News Indonesia. Mr Ramono added that there were plans in place to move a smaller group of rhinos to a secondary location, though there was "a lot [to be taken into] consideration". The rhinos which would be moved would have to be in good health, have close ties to each other and able to reproduce. But moving the rhinos to another location is easier said than done. The new location would have to have more than 200 species of plants - food sources for the Javan rhino. It would also need to have a plentiful water supply, an ideal soil type, land condition and a place with a year-round wet climate. "It's difficult to find the perfect location... we need at least five thousand hectares in one location. It has to provide [the rhinos] with [suitable] food, water. We need to know what diseases exist there, if there are predators, how supportive the local community is," the head of TNUK, Mamat Rahmat told BBC News Indonesia. Government officials have been looking for years to find a suitable second location for the Javan rhinos. They were supposed to have found one in 2017 - but this never materialised. "Sometimes the plan [does not] work out," said Mr Mamat. "There are many obstacles, technical factors, internal constraints and external factors [to take into consideration]." Mr Mamat adds that the government has surveyed 10 possible locations, of which one has arisen as a suitable candidate - the Cikepuh Wildlife Reserve in West Java. However, this was not without its problems. "There is an agreement [there] with the army about the use of land for combat drills. We need to do further studies on how the [sound] of guns and cannons could [impact] the rhinos." Human activity also exists around the wildlife reserve - which could put the rhinos at risk. The plan to move to the Cikepuh Wildlife Reserve appears to have stalled, but after the recent tsunami officials are once again moving with urgency. "We [will] take more steps quickly in preparing a second habitat [for the rhinos]," said Mr Mamat. "If one day Ujung Kulon is hit by an eruption, then [we would hope] there would still be reserves [of Javan rhinos] in a new place."